The City is London’s financial and historic district. Packed with stately buildings that house all sorts of financial services and law firms, the City was often considered staid. During my banking days, I was a frequent visitor to the City. So, yes, there’s some truth in that. Aside from London’s two iconic landmarks, the Tower Bridge and the Tower of London (home of the Crown Jewels), there wasn’t much else that would interest the casual visitor. The streets were abuzz in the daytime, with smartly-dressed people rushing to get somewhere. When the banking crowd went home in the evenings, the area became eerily quiet. In the past years, the City underwent a gradual makeover. Many new restaurants, bars and pubs opened their doors. The Spitalfields Market, near Liverpool Street Station, was renovated and now houses a variety of trendy boutiques and stalls. Historic pubs were refurbished – thankfully, without losing their unique character – to cater to a more discerning crowd. I witnessed this transformation first-hand on my frequent visits to the City and my appreciation for this historic corner of London grew. Whereas in the past I would often choose to stay in locations such as Soho, Bloomsbury or Kensington, on my most recent trip, I chose to stay at a boutique hotel in the heart of the City: Hotel Indigo Tower Hill. It turned out to be the perfect choice. 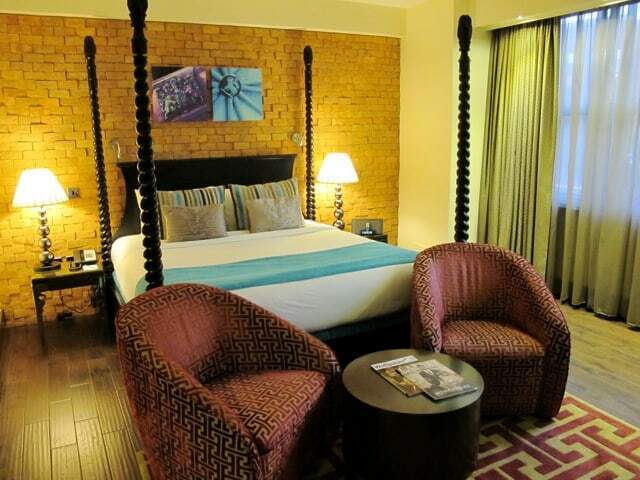 The hotel is part of the Hotel Indigo boutique hotel chain owned by the Intercontinental Hotel Group. The exterior of Hotel Indigo Tower Hill is pretty unassuming but as I walked through the doors, I was welcomed by big smiles in an intimate red-granite Lobby. Adjacent to the Lobby is the hotel’s stylish Square Mile Kitchen & Lounge. Checking in was a breeze and before long, I was standing at the doorway of my room. The bright colours and illustrations of popular London landmarks in the hallway should’ve given me a clue of what to expect. Nevertheless, I gasped as soon as I opened the door. The spacious room was a clever mix of classical elements, such as the four-poster bed, and funky design. 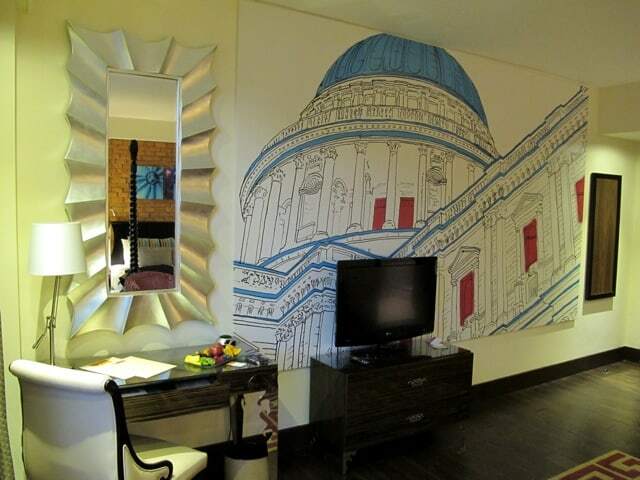 A large mural of St. Paul’s Cathedral and the beautiful mirror above the writing desk grabbed my attention. The natural materials used in the interior such as the wooden flooring and the brick wall gave the room a warm, elegant ambiance. The earthy colours were beautifully punctuated by the striking mural and photography on the walls, and the cheery colours of the pillows and blanket. The bathroom was another delight. Aside from the cool amenities, there was a fantastic rain shower which turned out to be the perfect antidote to a busy day. 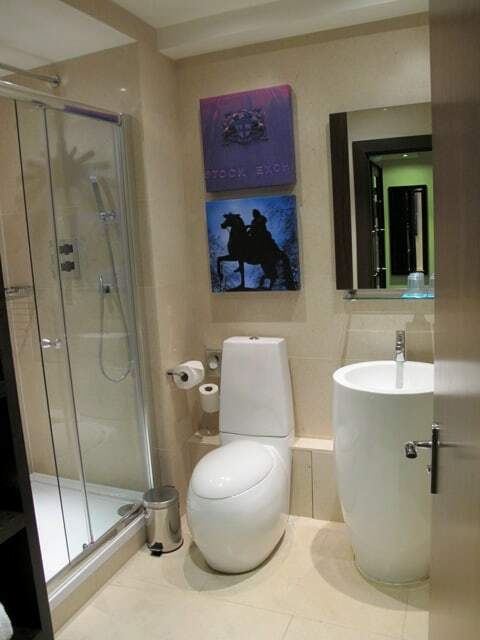 Hotel Indigo Tower Hill is centrally located in the City near the Thames River. 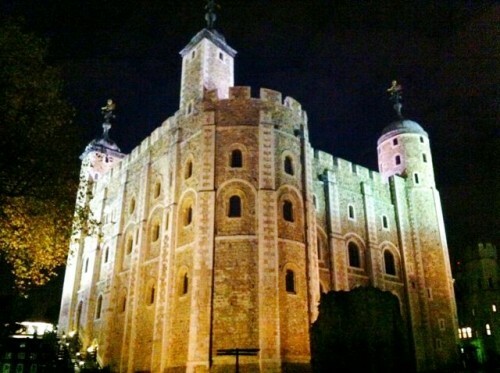 The Tower of London and Tower Bridge are a short 5-10 minute walk away. The Tower Gateway DLR station – with direct connections to London City Airport and the ExCel exhibition centre – is a few minutes away. There are also two Tube stations nearby: Tower Hill and Aldgate. Aside from the two main attractions, Tower of London and Tower Bridge, the hotel is close to one of my favourite spots in London, St. Katherine’s Docks, a lovely marina with historic lock bridges; and the historic Butler’s Wharf, just across the Tower Bridge. There’s also a good variety of restaurants – excellent Thai and Indian food can be found just across the road – and sandwich bars (I love EAT! 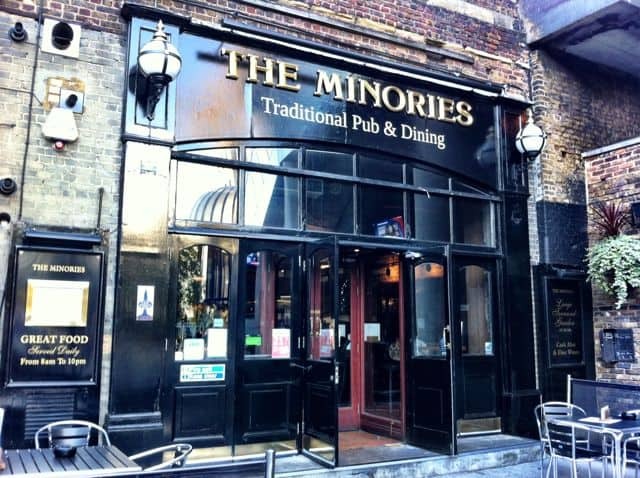 ), as well as a good mix of traditional and trendy pubs such as The Minories, Cheshire Cheese, Crutched Friar and Mary Janes in the direct vicinity of the hotel. I’ll most certainly return to Hotel Indigo Tower Hill. Its location is fantastic and I was certainly impressed by the friendly service at the hotel. Above all, I loved the rooms! Oh, did I mention that the hotel also offers FREE WIFI? Its boutique set-up makes it the perfect home away from home for both casual and business travellers. In my view, the City has done a good job in dusting off its staid image. 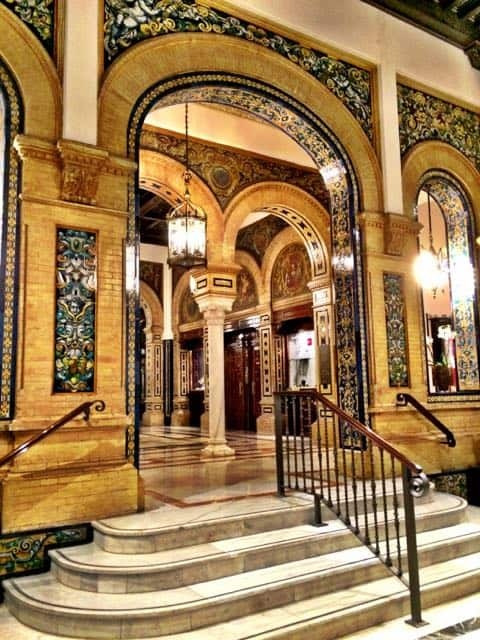 Hotel Indigo Tower Hill is a great example of this hip new breeze blowing through the City. Read about Velvet Escape’s recommended things to see and do in London. Note: A big thank you goes to Hotel Indigo for your wonderful hospitality. Opinions expressed in this post are, as always, mine. Cheers Andy! Sure enjoyed my stay there and it’s in one of my favourite corners of London. Looks like a great place to stay Keith. I love that part of London too – I stayed right by St Pauls at a Grange Hotel which was really nice too. The South Bank is a great place for a wander too. London is beautiful.Hotel Indigo looks beautiful and luxurious.Awesome mural. 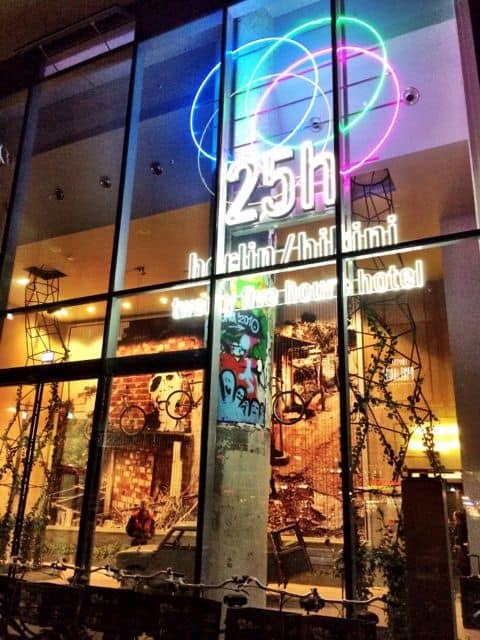 I love the design of this boutique hotel. It looks like a fab place to stay next time I’m in London. Great article and pictures as well. Looks like a great place to stay! Oh my goodness, I love the mural! Thanks for your comment. It was my first ever stay at a Hotel Indigo and I loved it. Will definitely check out their other hotels on my travels. I’m a bit of a hotel junkie, and Hotel Indigo is one of my favorite brands…a great addition to the group.